I grew up in California where I began taking piano lessons from Mrs. Davis when I was 8 years old. I had wanted to take lessons for some time, but who knows why because we didn’t have a piano in my home yet. 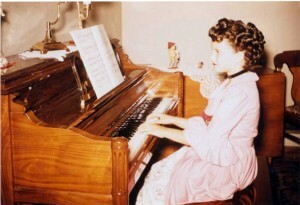 My parents promised me that when I turned 8 they would buy a piano and then I could begin lessons. I remember always liking to practice. I still like to. My mother says that the house could have burned down while I was “playing that piano” and I wouldn’t have noticed. Here is a picture of me dressed up for my first piano recital. I played a piece called “The Queen’s Harpsichord,” and my mother made me a dress that fit the era. I took piano lessons from Mrs. Davis through my sophomore year of high school. My junior year was spent in Brazil where my father was on a sabbatical leave from his university professorship. While in Brazil I did not have access to a piano which was frustrating to me because I already planned to study music in college. I was further frustrated to return to California for my senior year of high and find that my piano teacher had moved out of state. I made the rounds looking for a new teacher but none were interested in working with an advanced student. Finally the choir teacher at the high school, for whom I accompanied and who was also a pianist, said that he’d help me prepare for entering college. 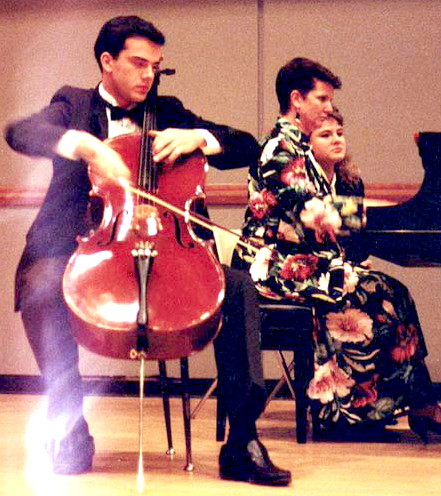 I worked hard but I was behind other piano students entering the Brigham Young University music program. But I persevered – I’m hard headed, I guess – and graduated in piano performance. My goal was to be the kind of piano teacher that I couldn’t find when I needed a good one. 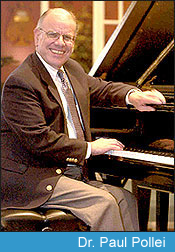 Here is a picture of my BYU piano teacher, Dr. Paul Pollei. I can’t say enough about the positive impact he made on my life, and the HUGE amount that he taught me about playing the piano and making music. If you want to know more about him, click on his picture. 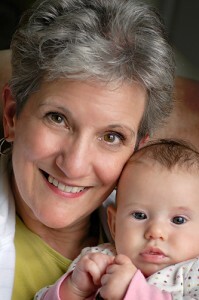 I was married just before my junior year of college and had my first baby just before beginning my senior year. And, as they say, the rest is history. I’m mom to seven grown children now, all of whom are musicians for fun – singing, playing piano, violin, cello, guitar. I spent many years threatening them if they didn’t practice and then thoroughly enjoyed accompanying their singing or instrumental playing. Still do enjoy that whenever I get the chance. Here is a picture of my son Jeff and me playing in a recital at BYU a bunch of less-gray years ago. Which brings me to the present… I am still married, mom to 7, mom-in-law to another 7, grandma to 26, accompanist for the Children’s Centennial Chorus, and piano teacher to 30+. I am still trying to get good at all those jobs and happy to have the opportunity. Gay Slade Piano Studio is powered by	WordPress 4.4.18 and delivered to you in 0.128 seconds using 16 queries.